The tousle-haired king sophisticated cool - David U.N.C.L.E. McCallum - leaned easily against his luxurious dressing room door. He lit a cigarette and brushed a stray lock of hair out of his face, his piercing blue eyes staring into space. It had been a rough morning on the series; he was tired. His wrinkled and soiled white shirt was tieless and disheveled. But his aura of cool was perfectly intact, despite the fact that he had spent hours shooting and reshooting one heck of a fight scene. All he wanted was to sneak into his comfortable dressing room and relax for an hour or so - after all, everyone else was breaking for lunch. He wondered how he had gotten himself into this situation. Standing around waiting for some little teenager to have her picture taken with him. Bored, he blew out a thin line of blue smoke. And waited. Others, who were standing around David, felt nervous and almost sorry for the girl. No doubt she was too excited to imagine that her idol could possibly have better things to do. No doubt she was on her way this minute, too thrilled to suspect that for David this meeting was old stuff. A drag, really. Davids agent knew he would never be rude to the kid, not exactly friendly, but at least not rude. And so they waited. Suddenly, the sound of footsteps could be heard as the door to the huge MGM sound stage opened. It sounded like an army to David - he really wished he could skip the whole thing. His worst suspicions were confirmed as a small crowd of at least 10 men and women moved toward him. Her armada, he thought in annoyance - all that to-do for one little girl. It was too much really. He pulled himself up resignedly and took a deep breath. After all, wasnt this the name of the game? Faces, names, handshakes, then the group seemed to part as if on cue and there standing alone was the girl. The rest of the people seemed to disappear. All David could see was an incredibly, dazzlingly beautiful girl smiling imperturbably at him. She extended her hand; it was cool. Hello, Mr. McCallum. Im Sandy Roberts. Her smile grew wider; her bottle green eyes looked deep into his and never wavered. David caught his breath and colored slightly as he returned the handshake and hello. Here was no silly, screaming teenager like the ones who followed him everywhere he went while on tour. this was a gorgeous, poised young lady. If David really was her idol, she gave no sign of it. Her manner was polite and friendly but a trifle, was it actually a trifle bored? David could hardly believe it. All eyes were on Sandy. If David was shocked, those standing with him were even more so. They had long ago grown accustomed to the screaming, clothes-tearing teeny boppers who had made him miserable with their antics more than once. This girl took it all in her stride! Stranger still, they found themselves under Sandys spell, too. That pure white skin, her blinding smile and upturned nose - almost too perfect to be real. As the photographer and editors gave directions, David was nearly lost in the shuffle. Everyone was helping Sandy, showing her around, smiling at her, trying to get her attention. Finally she disappeared into Davids own dressing room to change clothes for the photographs. David seemed a little dazed. She had come on like gangbusters, and he was left holding a half-smoked cigarette and little else. But when she reappeared, radiant and serene in a white lace mini dress, Davids resistance must have just melted away. How could anyone possibly find this lovely girl anything but captivating? From then on he seemed determined to charm her. While they posed for the cover of TEEN, he talked and laughed animatedly. Sandy responded in kind and the two got along famously. More than once, young directors and actors slipped into the set and stood round-eyed, looking at Sandy. She was a breath of fresh air the weary hustle bustle of Hollywood. Who is she? You could hear the whispered question flashed like wildfire from one to another. Most who came to see stayed to be conquered by Sandys wit, charm and beauty. Not once did she give a sign of fatigue or self- consciousness. Not once did her poise falter or her smile grow fixed. She was exhibiting the amazing resilience and sincerity that had made her an overwhelming choice for Miss Teen America, 1967. But who seemed to be dazzled beyond all help? David, of course. David, who had thought it would be a bore, acted as if it were the greatest day in all his life. He was acting almost like a teen himself. And in truth, with his Beatle-cut hair and boyish smile, he looked like a teenage boy - thunder-struck by a girl! It was almost unbelievable! 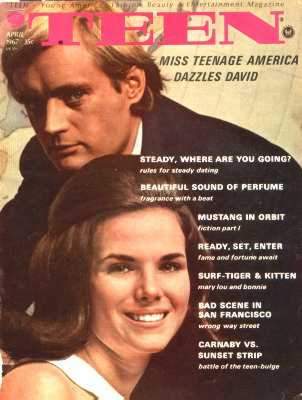 A small slip of a girl flipped the cool of THE David McCallum! What had originally seemed to be a casual publicity coming together began to take on all the drama of a confrontation. While she was cool and regal, almost remote at first, David was simply bowled over and only too eager to please her. History was being made that day. A teen idol had met his match! She came, he saw, she conquered! After the cover photos had been taken, Sandy hurried back to Davids dressing room to change into her street clothes. David lingered awhile, looking for all the world as if he didnt have another thing to do but wait all day for Sandy. But when Sandy came out of the dressing room in her sharp-looking camel coat, she looked like a girl with a purpose. She had checked her schedule and found that her time had run out. If David had time to spare, Miss Teen America unfortunately didnt. As she made her farewells, one could tell that David would have liked an opportunity to speak to her longer, much longer. But she had time for only a quick smile and a long level look from her sea green eyes before she turned and disappeared into the crowd that always surrounds her. David just stood there with a strange, puzzled look on his face. He was impressed. He was totally switched on! but he was too late - she was gone. No doubt he wondered a hundred times in the next few weeks how and 18-year-old girl, who should have been switched on unbelievably by him, had turned the tables! You are probably wondering if that was the end, that one meeting. Did David forget her after a few weeks of wonderment? Did their busy schedules make a coming together impossible? Did the difference in their ages make a relationship ridiculous? Still, she is a mature young lady, and David is nothing if not vibrantly youthful and alive. Did he have second thoughts? Did she? Did her parents see danger there and nix it as soon as they could? Perhaps and even bigger question is what did Sandy think of David? She was very nice to him, but then she is that way to everyone. Its part of her loveliness. Perhaps he was just another fellow among the many who doubtless would like to know her better. Lucky Cinderella that she is, perhaps the incredibly hectic schedule she keeps simply nips any romance in the bud. Even if she were crazy about David from that one meeting, when would she see him? She is booked up (almost) every single weekend of the year- not with dates but with activities stemming from her title as Miss Teen America. There is a mysterious aftermath to this whole exciting chapter in David and Sandys lives. We know for a fact that in Sandys home town of Milpetas, California, something very strange and touching has been happening. The florist will say nothing. He merely delivers a single white rose to Sandys house everyday, with an unsigned card tied to its slender stem. Stranger still, the ribbon that ties the card is the brightest possible blue - like Davids eyes maybe?